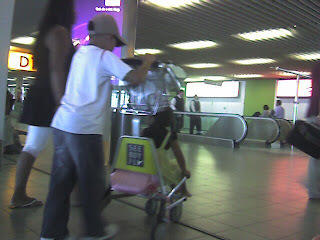 We had an hour or two layover in the Amsterdam airport en route to Edinburgh, a multicultural hubbub of activity. The airport is organized with central food court areas and decentralized security every so often for small groups of gates along the concourses, then a final security check at the gates. Everyone gets a pat search coming through security. Ubiquitous small carts add to the character. Although advertising Mastercard, they appeared to be freely available in long queues, and more than half the pedestrians sported one, small items and purses in the basket on top and soft duffel bags on the short platform below, with the occasional small child hitching a ride. Roll-aboards were not nearly so popular, possibly because they are too big to fit overhead on most of the planes and have to be checked at the gate, anyway. The best thing about coming through Amsterdam was that we arrived in Edinburgh with all of our luggage. There is a very high percentage of people at the meeting who arrived without theirs, and all of them came through London. Take that under advisement. Good for Amsterdam! There has been a lot of comment in our news recently about the lost luggage from Heathrow and Gatwick. Last year I lost mine on a flight from Gatwick to Malaga, Spain. It went to St Kitts and Antigua, back to Gatwick before coming to me in Malaga! Yikes! I heard about these troubles after our flights were booked, so my good fortune is partly a lucky accident.